Damn it. 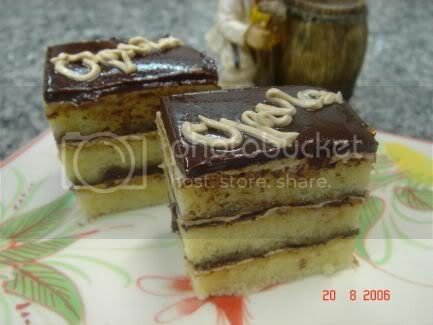 I'm making opera cake. This is one of those things I've been wanting to do, and putting off, for some time now, about 14 months. 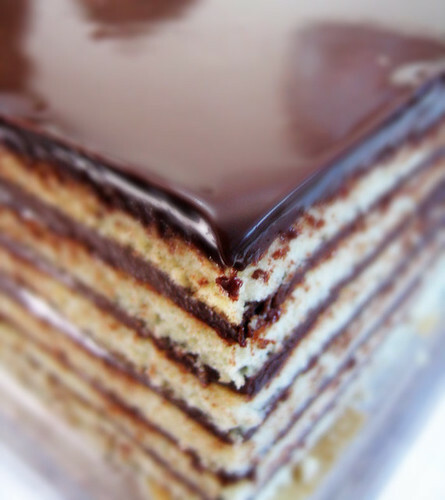 Making an opera cake always seems like it will required more shopping, preparation, and concentration than I have time or patience for, and I just keep saying, "Maybe next month." But today is economic stimulus day. I just got my federal tax refund, and I want to celebrate by doing some baking and buying some things for my kitchen. First, I need a recipe. There's one from a la Cuisine that I've had my eye on. Next, I'll need some equipment. Although I own a half sheet pan, it doesn't properly fit in my oven, which is pint-sized. I use it all the time anyway, sliding it in at a tipped angle. This works well enough when baking cookies because they stick to the Silpat mat, but if I tried to bake a cake like this, all the batter would run off. So I'll need a pan. 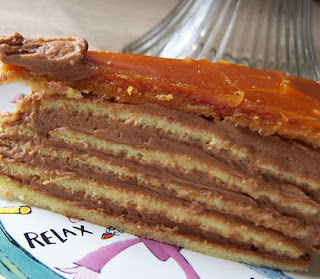 I know opera cake is traditionally made in rectangles, but maybe I'll buy a spring form pan and make a round cake instead. I was inspired by this cake, which that shows you can achieve very thin cake layers in a round spring form pan. I also need an offset spatula. Third, I need to go to the grocery store and buy almond flour, eggs, butter, heavy cream, and a few more ounces of dark chocolate (I have a bar of Green and Black's 70% in my cupboard). I'll be using organic free-range eggs, which are almost twice as expensive as non-organic caged eggs, but worth it. They are far superior. Finally, I need aspirations. I'm the kind of person who learns best when I see someone else model a behavior or technique. In this case, I've been looking for images of both the process and the final product. 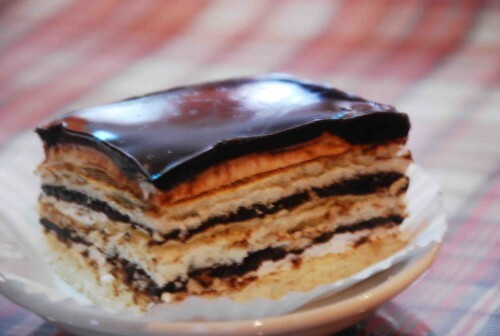 I have a minor obsession with wanting to go to Vietnam for the food and culture, and now that I know there is opera cake there, well, it's on my agenda! Hopefully I can get there faster than I can make an opera cake (14 months in the planning).